February | 2008 | News from Notch Consulting, Inc.
CBp Carbon Industries, based in Bratislava, Slovak Republic, is one of several companies offering new generations of tire recycling technology. According to CBp Carbon Industries, its technology permits the recycling of tires and scrap rubber into commercially viable components of steel, oil and carbon black. The company is expanding its capacity and plans to issue its stock in the United States. The CBp Carbon Green technology recycles 100% of used tires and scrap rubber. Approximately one-third of resource recovery results in CBp Carbon Green and the remaining two-thirds are high value oil, gas and steel. The recycling of the CBp Carbon Green also prevents in excess of one tonne of greenhouse gases from being generated for each tonne of CBp Carbon Green substituting for the normal industry carbon black. CBp currently operates one commercial tire recycling plant in Hungary and is building a second in Cyprus. The plant in Hungary is being expanded by mid-March 2008. The plant in Cyprus is fully permitted and commercial production is scheduled to begin in August 2008. Note: that price assumption for virgin carbon black seems high, at least for rubber grades. US prices for N-339 averaged just under $1,000 per tonne as of 4Q 2007 (large volume contracts, ex-works). So if the price of recycled carbon black is 20% higher than virgin with oil above $100 per barrel, the economics of this process seem questionable. Here is the company’s press release detailing their plans. On February 26, Solutia Inc. announced that it had received bankruptcy court approval of its exit financing and planned to emerge from Chapter 11 tomorrow — on February 28, 2008. Under the new plan, Solutia’s $2.05 billion exit financing package would be funded by Citigroup Global Markets Inc., Goldman Sachs Credit Partners LP, and Deutsche Bank Securities Inc. Solutia previously had filed suit against its financiers over delays in its exit financing. Solutia’s press release on the new financing is here. Previous blog entries about Solutia’s Chapter 11 restructuring are available here and here. From Scientific American, word of a new “self-healing” rubber that can be cut and rejoined at the same spot simply by pressing the broken parts together. The material’s secret is its molecular structure, which resembles a plate of spaghetti, says physicist Ludwik Leibler of the National Center for Scientific Research (CNRS) in Paris, who led the research team. The strands straighten out when pulled, but they relax back to their tangled shape when the tension is released. The result is a rubber that can stretch to six times its resting length, the group reports in the journal Nature. The self-mending occurs because each strand consists of numerous small molecules of vegetable fat linked to each other and to far-flung neighbors via relatively weak hydrogen bonds, the same chemical bonds that give water molecules their cohesiveness. When the material was cut or ripped, the severed bonds remained chemically sticky for each other. Potential applications include sealants, pavement, and medical pouches. No word yet on self-sealing tires. Arkema is working on scaling up production for more research. On February 18, there was a major fire at Alon USA’s refinery in Big Spring, Texas. There were no fatalities in the fire, but four workers were injured. The entire refinery will be shut down for repairs for at least two months, and the FCC unit may be down longer than that. Here is another article detailing the fire. Alon supplied about half of the CBO requirements for Sid Richardson’s Big Spring carbon black plant. Sid Richardson reports that its carbon black plant was not damaged by the fire, but it was operating at half capacity until new oil sourcing could be arranged. Sources at Sid Richardson now report that the Big Spring plant will return to full production levels this week. The company reports that with existing inventory and half production, no shipments were missed. RAG-Stiftung has clarified its plans regarding Evonik Industries’ pending IPO, according to Forbes. Earlier this week, it was reported that RAG had scrapped plans for an IPO and was seeking a direct buyer for the entire company. However, the company’s by-laws do not allow for a complete sale. Instead, RAG-Stiftung plans to sell a 25% stake in Evonik Industries to a financial investor. Possible investors whom RAG plans to approach include Permira, BC Partners, KKR, Bain Capital, and Blackstone. In a second step, 50% of the company’s stock would be solid in an IPO no sooner than 2009. RAG-Stiftung would retain a blocking minority stake of 25%. Several major developments regarding Rhodia’s highly dispersible silicas. At the Tire Technology Expo in Cologne last week, Rhodia Silicea introduced its Zeosil Premium range, which is a new generation of high surface area silicas for tires. On Day Two of the conference, Rhodia’s Philippe Cochet discussed the products in a paper entitled “New Silica Technology for High-Performance Tires.” The result of eight years of R&D work, the Zeosil Premium range offers a unique structure that, according to Rhodia, allows for good dispersibility (for a high surface area particle), improved mixing, and good tread reinforcement. In addition, the particle’s new morphology provides greater interaction with the polymer, giving a good balance of reinforcing properties and viscoelasticity. According to Rhodia’s people on the trade show floor, this range of properties will allow a more favorable balance of the ‘magic triangle’ tread performance characteristics (i.e., rolling resistance, wet grip, and tread wear or abrasion resistance) than was previously possible with HDS. Specifically, the new grade will allow for reduced rolling resistance and good wet grip without the traditional trade-off in tread wear. Until now, Rhodia’s high performance silica has made it possible – without any reduction in tire wear performance – to improve road grip in wet conditions by 5-10% and reduce rolling resistance by 25%. This lowering of rolling resistance corresponds to a reduction in fuel consumption and CO2 emissions of approximately 5%. “Zeosil® Premium pushes back these limits even further and provides an additional reduction of almost 10% in rolling resistance, whilst improving road-holding and tire wear resistance”, comments Philippe Cochet, Silica Business Development Manager of Rhodia Silcea. Also, on February 20, 2008, Rhodia announced the formation of a new company, RSQC (Rhodia Silica Qingdao Chengyang), to manage the construction and operation of its new precipitated silica plant in China. The new plant was announced in November 2007. RSQC will be a wholly owned subsidiary of Rhodia and will be based in Qingdao, where Rhodia already operates a silica plant. The new silica plant is scheduled to start up in July 2009 and will focus on producing highly dispersible silica for fuel-efficient tires. The plant will be built using a modular design to facilitate easy expansion. According to the European Rubber Journal (subscription required), the new plant is expected to be the second largest precipitated silica plant in the world upon start-up and will become the largest plant worldwide after its first expansion. According to Thomson Financial, the proposed initial public offering from Evonik Industries AG has been put on hold due to current uncertainty in financial markets. Instead of an IPO, the company is investigating being acquired by a direct buyer, and Evonik’s supervisory board chairman Wilhelm Bonse-Geuking is in contact with potential investors from southeast Asia, Dubai and the US. Talks are scheduled to begin on April 22. On February 14, 2008, Sumitomo Rubber Industries held a meeting to highlight its recent technological development work. According to a piece in Tech-On on the meeting, Sumitomo President Tetsuji Mino highlighted three recent developments: a tire made almost entirely of natural (i.e., non-petroleum) materials; a tire featuring a 50% reduction in rolling resistance; and run-flat tires. Sumitomo subsidiary Dunlop Falken Tyre Ltd. plans to introduce a new generation “eco-tire” on March 1, 2008 under the Enasave 97 tradename. According to Sumitomo’s press release on the new tires, only 3% by weight of the tire’s raw materials are based on petroleum — the antioxidant and the vulcanization accelerators. Using ENR (Evolutional Natural Rubber) technology, Sumitomo successfully substituted natural rubber for synthetic rubber throughout the tire, including sidewalls, innerliner and tread. The tire uses silica as the filler instead of carbon black, and vegetable oils instead of petroleum-based processing oils. In addition to being 97% petroleum-free, the new tires reduce rolling resistance by 35% compared to Digityre ECO EC201. Sumitomo accomplished this reduction through the use of a unique leaf-shaped tread pattern and specially conditioned natural rubber in the tread compound. Sumitomo has committed to introduce a tire using 100% non-petroleum materials, even if it takes “five to ten years.” According to Sumitomo, an average passenger tire (195/65R15) typically includes about 44% natural materials, mainly natural rubber and oils. In March 2006, Sumitomo introduced the ENASAVE ES801, which was touted as being 70% petroleum-free. Sumitomo also announced plans to introduce a tire with a 50% reduction in rolling resistance, which would improve fuel efficiency by 10%. The timeline for commercialization of this tires has not yet been determined. Finally, Sumitomo announced it would ship 100,000 run-flat tires to Japanese automakers in 2008, including Toyota, Honda (for Acura), and Nissan. Sumitomo’s total shipments of run-flats in 2008 are expected to total 1 million, with most sales to BMW. Sumitomo sells run-flats under the Dunlop brand. According to the European Rubber Journal, Aditya Birla has declined to confirm reports that it is planning to build a new carbon black plant in Sri Lanka. Dr. Rakesh Jain, Birla’s global director for carbon black, was quoted as saying, “We are always exploring new opportunities that will help create shareholders’ value and grow the business. As of this moment, it is premature to comment on our plans.” The ERJ article is here (subscription required). Plans for the new plant were discussed in a previous post available here. The information was based on a press release and statements by Sri Lanka’s Ministry of Enterprise Development. From Singletrack, a site dedicated to mountain biking, comes a glimpse inside Continental’s bicycle tire factory in Korbach, Germany. 3 layers of carcass laid on to the tyre bead. 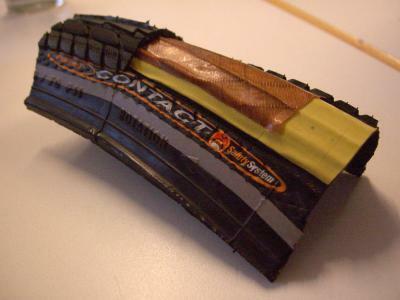 then either 2 layers of nylon “breaker” (anti-puncture reinforcement strip), OR 1 layer of Vectran (Kevlar) breaker (for higher end tyres). Chafer strip (which prevents rim damage to the tyre sidewall). The tyre then goes through the curing process (at 180c) and is steam-pressured in a mould to form the tread pattern. Photo: Singletrack magazine. Carcass is yellow, breaker is brown.